Woven Pink Pearl "V" Necklace with Vintage Enamel Floral Brooch by Marina J. One of a kind double row bead necklace hand wrapped with authentic vintage silk Hermes scarves and finished with authentic Hermes leather tassels. by Gordana Gasparovic. Adjustable length. One of a kind double row bead necklace hand wrapped with authentic vintage silk Hermes scarves by Gordana Gasparovic. Adjustable length. Red glass bead and gold flower necklace from Francoise Montague. 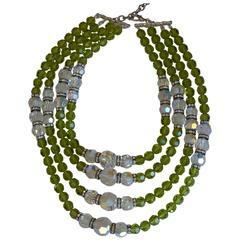 Multi row hand cut green and clear glass beads with Swarovski crystal rondelles from Francoise Montague. 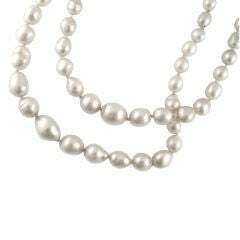 Shortest row is 15" L and longest row is 20"
Composed of 33 and 30 baroque pearls in silver and rose overtones, graduating in size from approx. 8 - 13mm, lengths - 15", and 16-1/2". Cultured.